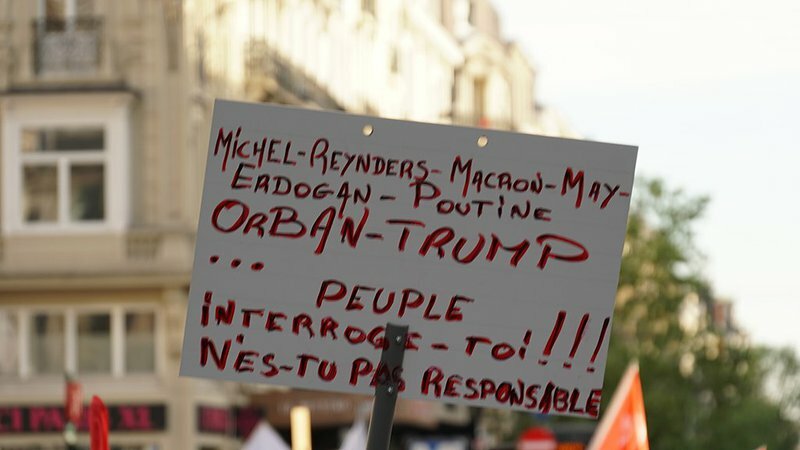 Protest March, Trump not Welcome, 24 May 2017, Brussels North Station. Credit: Flickr/miguel_discart_photos via Wikimedia Commons. CC BY-SA 2.0. Liberal democracy is floundering in places where it was long thought to be most securely established. In both Western Europe and the United States, polls suggest that many voters have lost confidence in democratic institutions, while political polarization and illiberal parties appear to be on the rise. A striking feature of this crisis is the perception that many of the most pressing political challenges are shared between the US and Europe. This represents a significant change from earlier decades, when most observers saw America’s democratic shortcomings as rooted in uniquely American political syndromes distinct from Europe’s own political troubles. But is this new sense of a shared democratic malaise accurate? To what extent are current democratic challenges in Europe similar to those facing the USA? Neither Europe nor the US are homogenous political entities: democratic problems vary widely from region to region and country to country. Yet at the macro-level some crucial challenges are clearly shared. A crisis of trust in political institutions is one of them. In 2017, for example, only 12 percent of Americans expressed a “great deal” or “quite a lot” of trust in Congress, down from 30 percent in 2004. 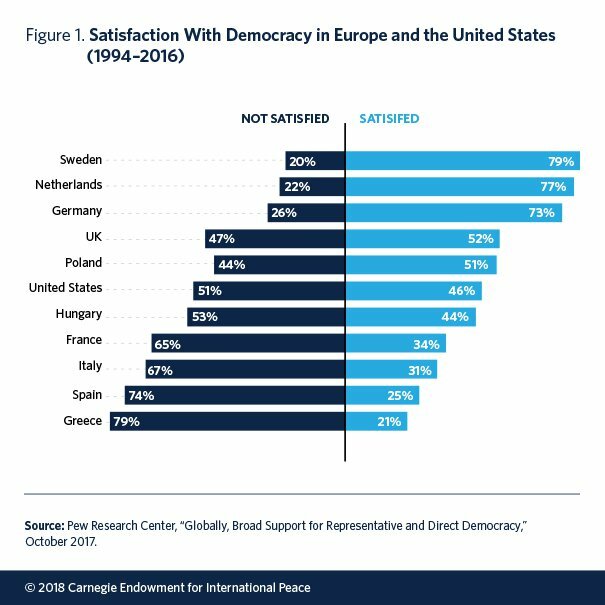 In Europe, the 2017 Pew Global Attitudes Survey showed alarmingly low levels of satisfaction with the functioning of democracy in France, Greece, Italy and Spain, as well as a large gap in trust in government between those who think the economy is doing well and those who don’t. On both sides of the Atlantic, political parties have borne the brunt of this discontent. Parties have long been one of the most disliked political institutions, but recent economic crises and tensions over immigration have worsened this disconnect. 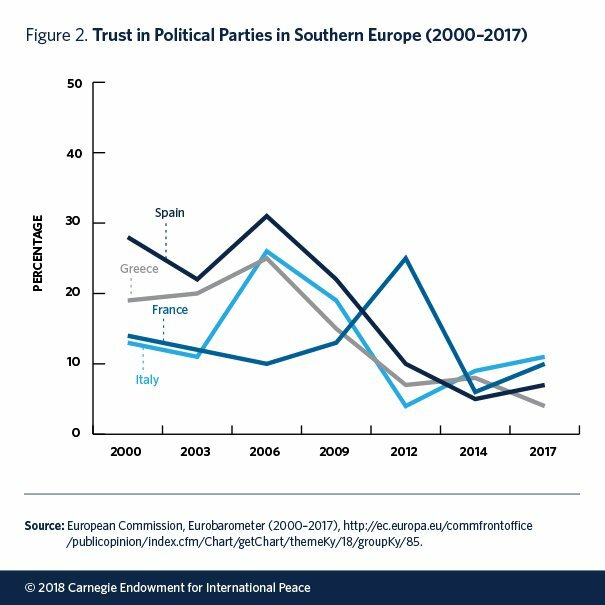 In France, Greece, Italy, and Spain, for example, fewer than ten percent of people expressed trust in their country’s political parties in 2014. The most striking consequence of this decline in trust has been a well-documented surge in support for self-proclaimed outsider movements and candidates. Not all of these anti-establishment forces are antidemocratic, and some have added new vitality to democratic competition. Yet others—like France’s Front National or Germany’s Alternative für Deutschland—clearly exhibit illiberal and xenophobic strands. And while European parliamentary systems are in some ways better suited to adapt to these changes than the US two-party system, greater party system fragmentation has also made it more difficult to form stable governments, thus causing more dysfunctional governance. Most recently, Germany was left without a government for six months as Angela Merkel’s Christian Democrats struggled to form a viable governing coalition. Both the US and Europe are also grappling with an increasingly fragmented public sphere. 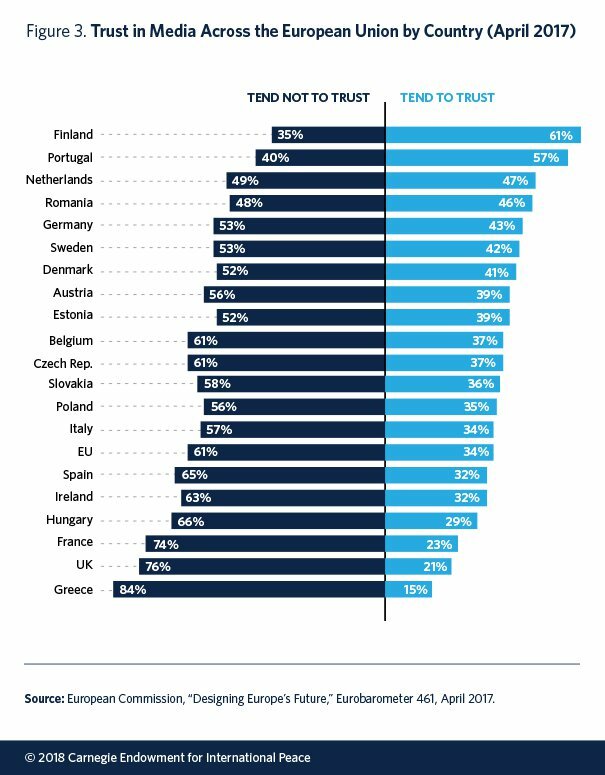 Across many European democracies and in the United States, trust in traditional media outlets is already quite low. In the US, this trend is exacerbated by heightened partisanship, with Republicans especially likely to have unfavorable views of mainstream news organizations. As more and more political discourse shifts online, domestic and foreign actors are also exploiting new platforms to sow distrust and undermine fact-based debate. For example, new research confirms that false political news spreads more rapidly online than verified information, though the full implications for people’s political views remain poorly understood. And while Russian efforts to interfere in US and European elections and key referenda such as Brexit have received much attention, policy responses remain fragmented. Despite these areas of convergence, the US faces some challenges that are more pressing than in Europe. Perhaps the most visible of these is partisan polarization. Polarization in today’s Congress is higher than at any time since the late 1800s, and the share of Americans with highly negative views of the opposing party has more than doubled since 1994. The causes of this trend are complex, harking back to sociopolitical changes that began in the 1960s. In practice, the result has been persistent legislative gridlock, as well as a greater willingness on both sides to disregard democratic norms, neglect congressional oversight, and play constitutional hardball for political gain. In addition to horizontal polarization between left and right, the US also struggles with exceptionally high levels of vertical polarization caused by deepening socioeconomic inequality. Weak institutional safeguards—particularly lax campaign finance and lobbying regulations—enable the highly privileged to exert disproportionate political influence. 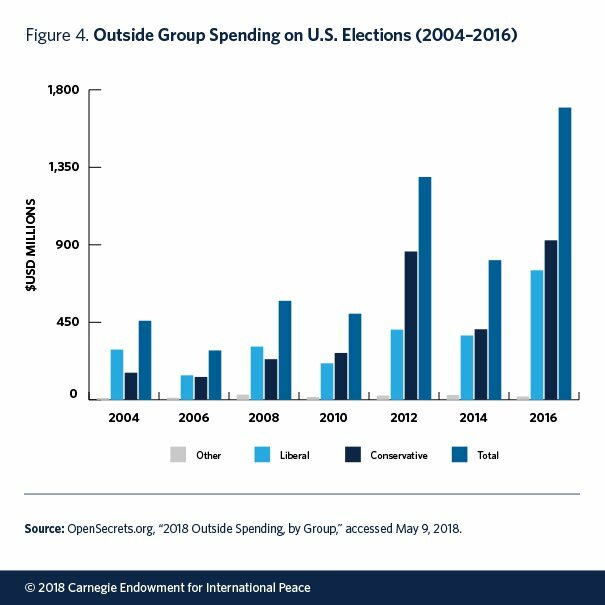 For example, outside spending on presidential elections has skyrocketed from approximately $339.5 million in 2008 to $1.3 billion in 2016. Costly campaigns perpetuate the overrepresentation of wealthy politicians and corporate interests, while low-income citizens participate in politics at much lower rates. While socioeconomic divides have also deepened in some European countries, the trend is most pronounced in the USA. Lastly, the US electoral system suffers from intense partisan disagreements over voting and redistricting rules. Since 2010, 23 US states have enacted new laws that make it harder to vote, particularly for low-income voters. Not surprisingly, voter registration rates and election turnout in the US are consistently lower than in Western Europe—despite declining turnout trends across many European democracies. Partisan gerrymandering has become another hotly contested issue, with critics arguing that allowing legislative majorities to redraw districts in their favor has undermined democratic competition and fair representation. However, European democracies also face some challenges that are more acute than in the USA. For example, European multiparty parliamentary systems—while more responsive to changes in political alignments—also provide more room for extremist and anti-pluralist political forces to gain political representation. In Hungary and Poland, democratically elected illiberal governments have already taken major steps to undermine independent civil society and the rule of law. While US President Donald Trump has displayed similarly illiberal instincts, he does not command control over an organized political movement, and at least to date, the US judiciary, civil society and much of the media have managed to exert a strong countervailing force. In addition, European democracies still struggle with the consequences of supranational integration: as more decision-making has moved from the national to the European level, efforts to boost citizen participation have not kept pace. Many voters feel disconnected from political debates in Brussels, which provides ample room for Euroskeptic politicians to mobilize support. In sum, both Europe and the US are grappling with heightened levels of distrust in democratic institutions, alienation from establishment political actors, and unease about an increasingly fragmented public sphere that is vulnerable to polarization. Yet they are also contending with specific patterns of political dysfunction. Identifying such areas of political convergence and divergence opens the door to a bigger question: can American and European actors striving for democratic reform learn from each other, and if so, what would be the most fertile areas for such learning? To date, linkages between US and European activists, reformers and experts are still underdeveloped; there are few networks through which to share lessons about effective responses to democratic challenges. But since people on both sides of the Atlantic are looking for innovative ideas, a transatlantic lens could open the door to more productive partnerships and more effective action. This article is based on a longer report from the Carnegie Endowment which is available here.